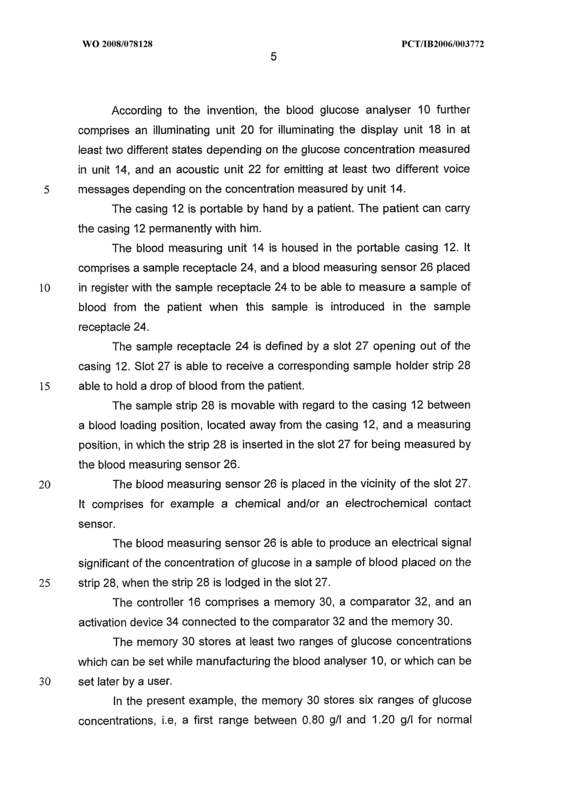 The blood analyser (10) comprises a blood measuring sensor (26) for measuring the concentration of the compound in a sample of blood of the patient and a display unit (18) for displaying the concentration measured by the measuring sensor (26). 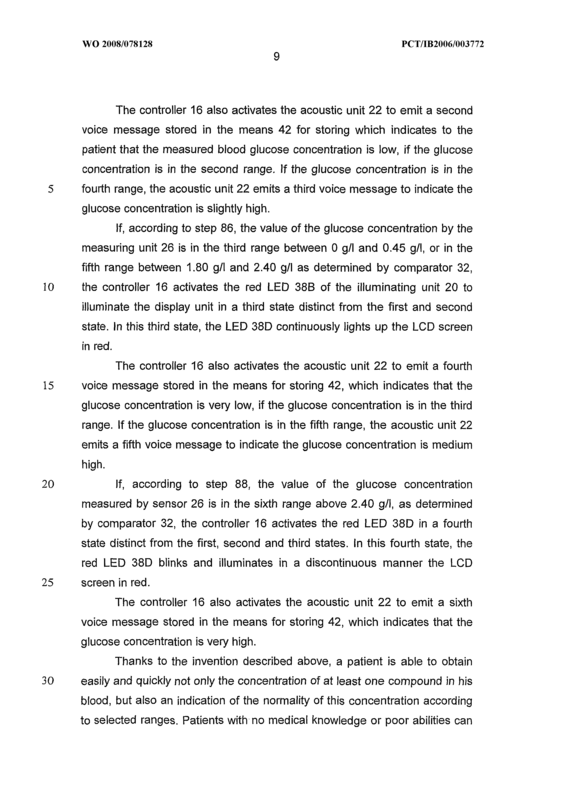 It further comprises an illuminating unit (20) able to be lit in at least two different states depending on the value of the compound concentration measured by the measuring sensor (26). 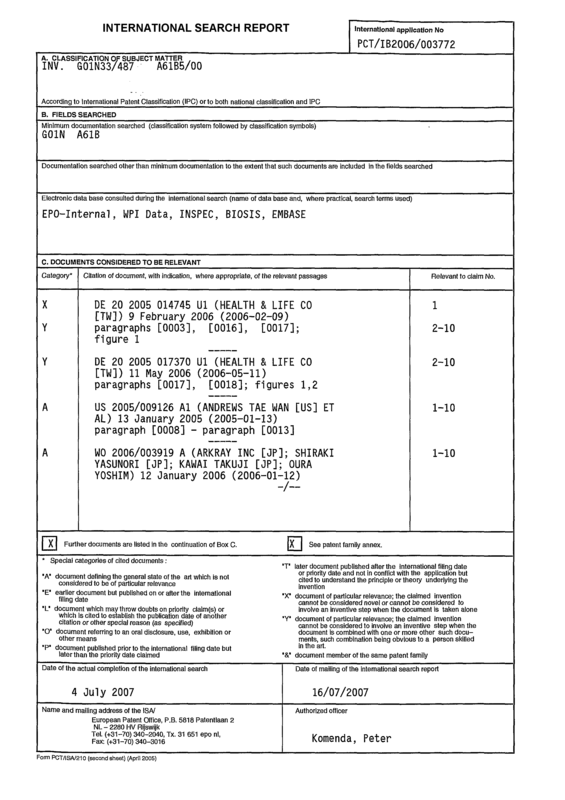 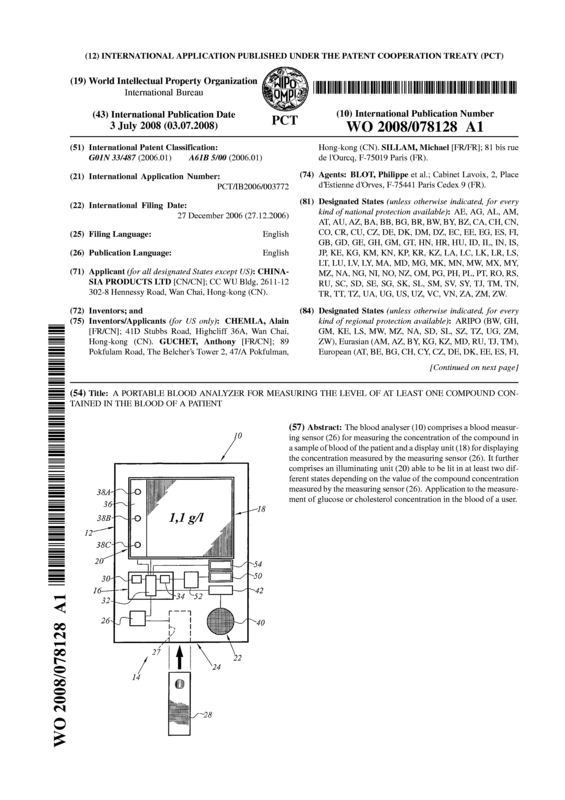 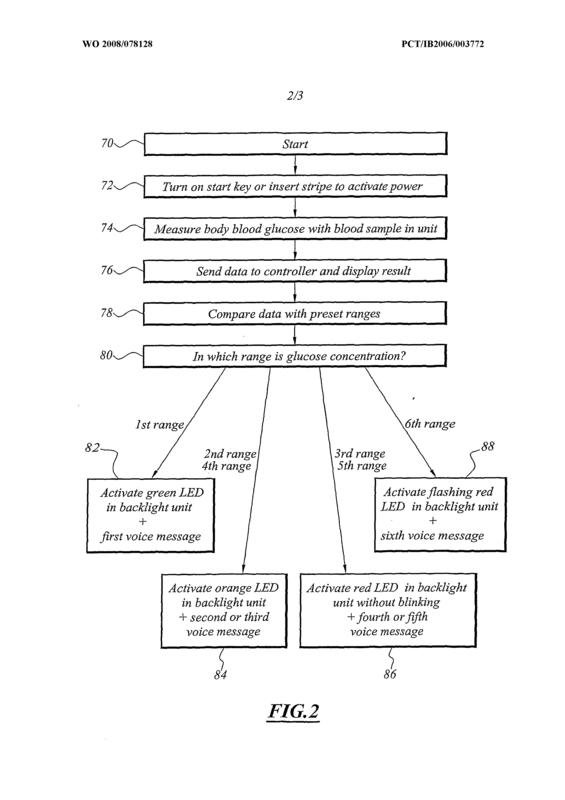 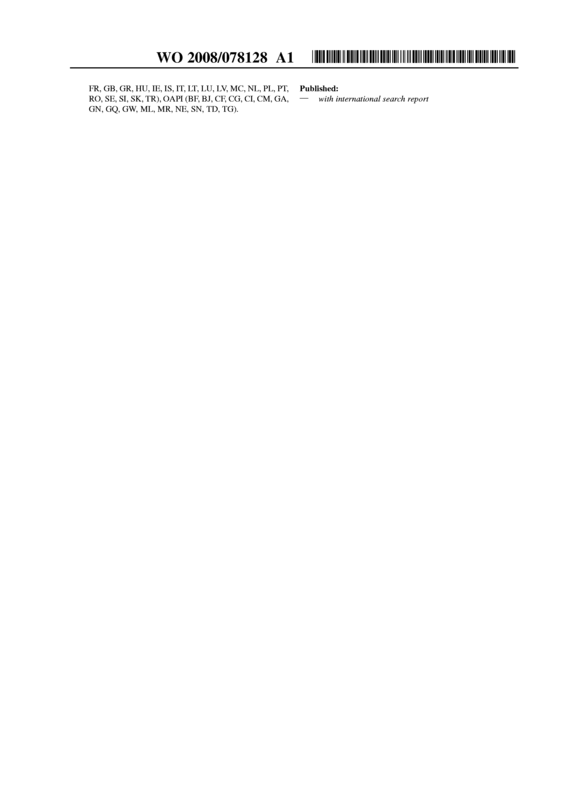 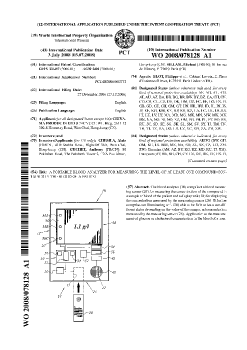 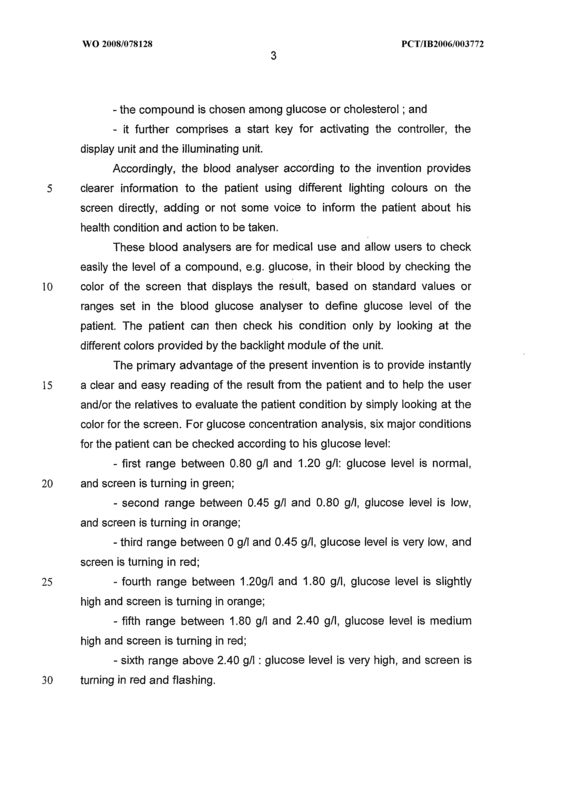 Application to the measurement of glucose or cholesterol concentration in the blood of a user. 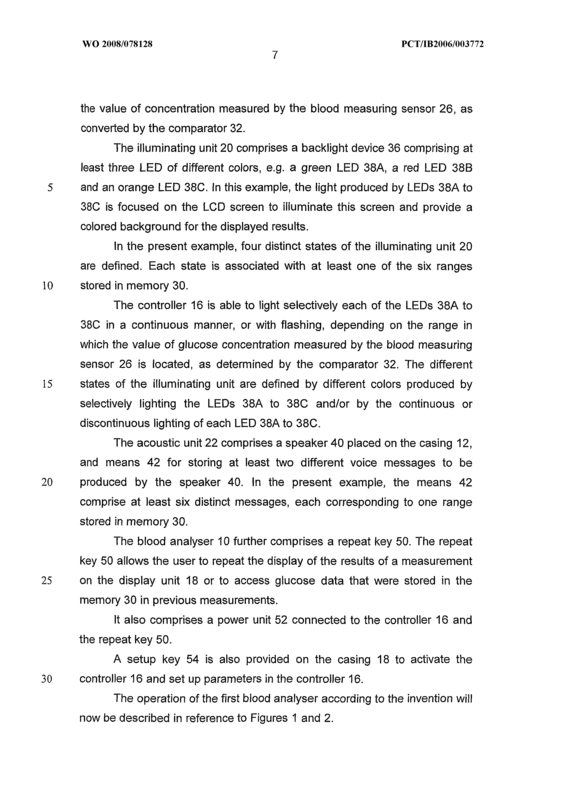 - an illuminating unit (20) able to be lit in at least two different states depending on the value of the concentration measured by the measuring sensor (26). 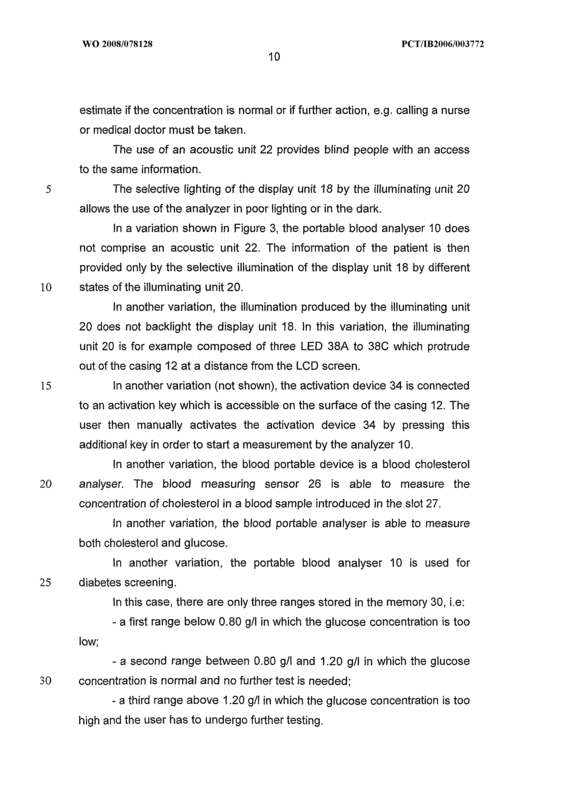 A portable blood analyser (10) according to claim 1 , characterized in that the light generated by the illuminating unit (20) is focused on the display unit (18) to allow the compound concentration displayed on the display unit (18) to be read in the dark when the illuminating unit (20) is active. 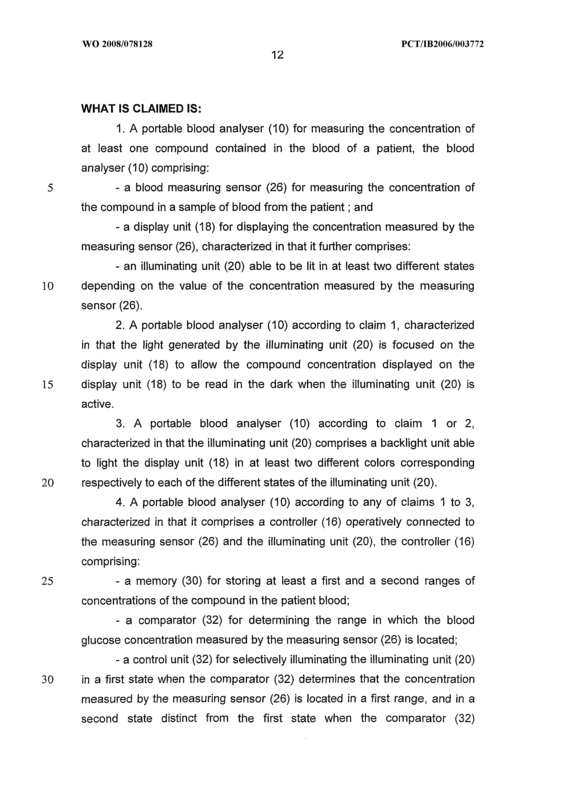 A portable blood analyser (10) according to claim 1 or 2, characterized in that the illuminating unit (20) comprises a backlight unit able to light the display unit (18) in at least two different colors corresponding respectively to each of the different states of the illuminating unit (20). 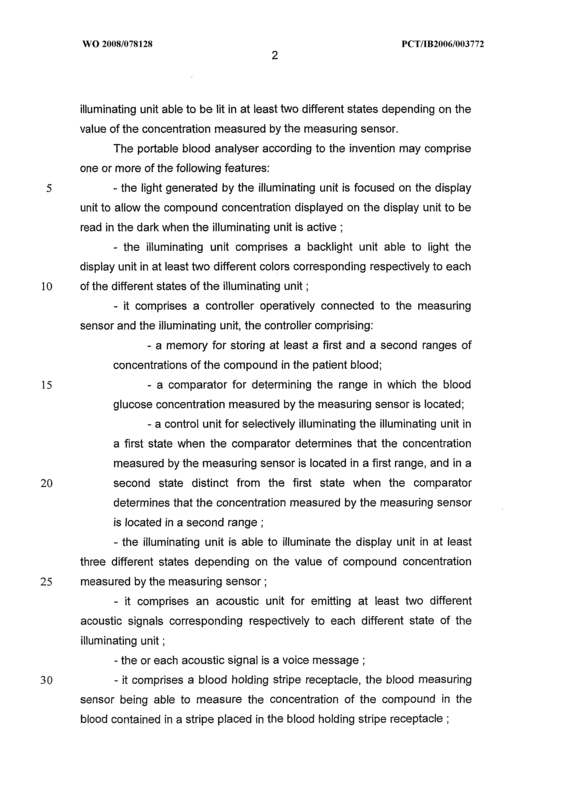 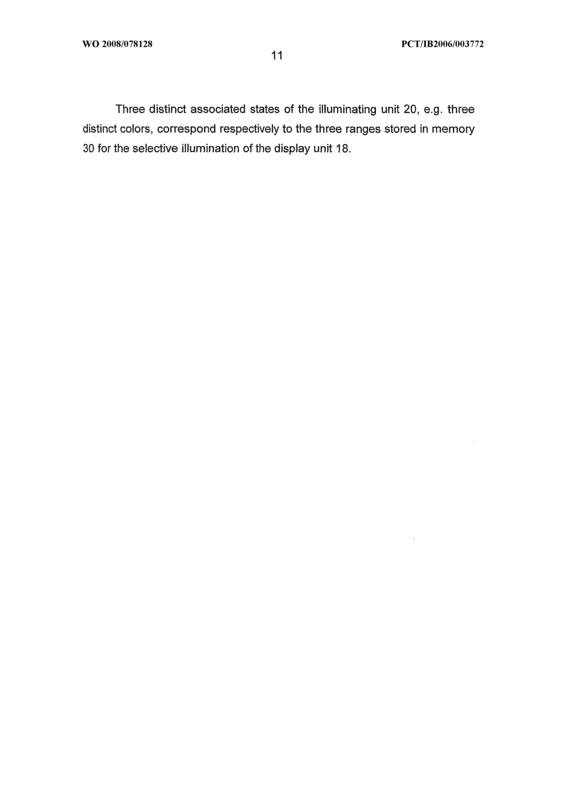 - a control unit (32) for selectively illuminating the illuminating unit (20) in a first state when the comparator (32) determines that the concentration measured by the measuring sensor (26) is located in a first range, and in a second state distinct from the first state when the comparator (32) determines that the concentration measured by the measuring sensor (26) is located in a second range. 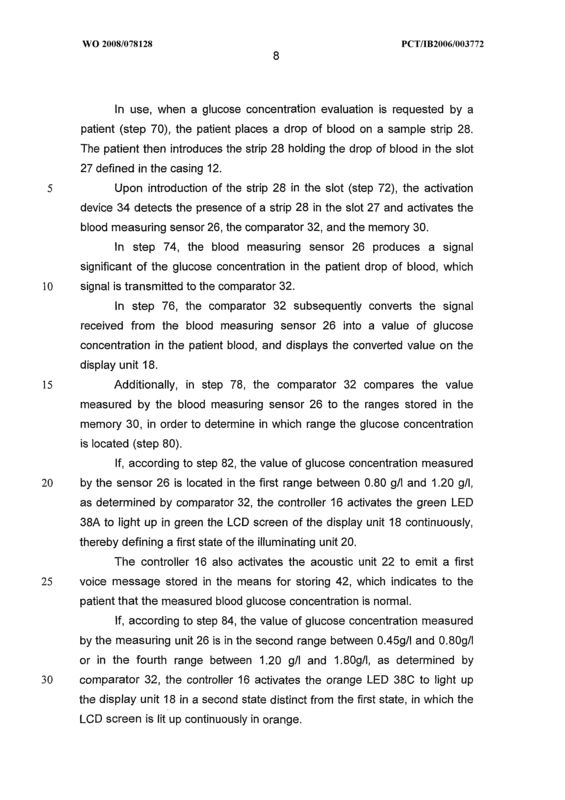 A portable blood analyser (10) according to any of the preceding claims characterized in that the illuminating unit (20) is able to illuminate the display unit (18) in at least three different states depending on the value of compound concentration measured by the measuring sensor (26). 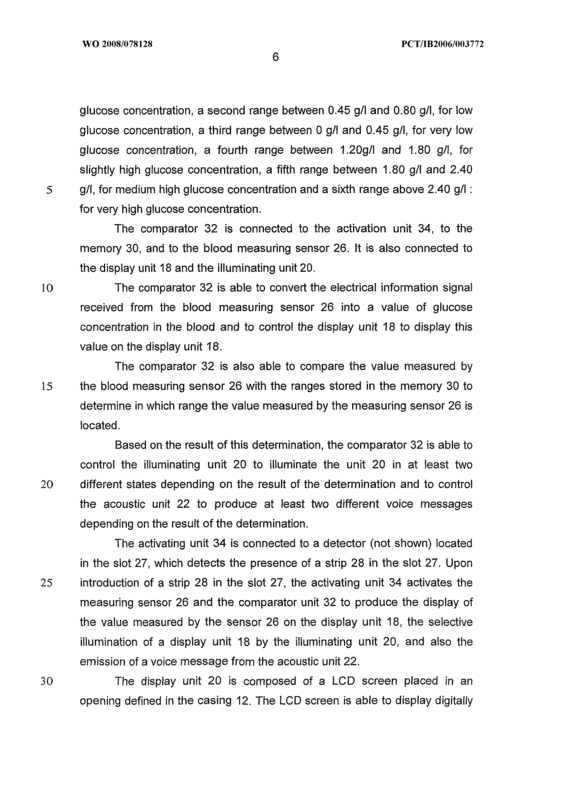 A portable blood analyser (10) according to any of the preceding claims, characterized in that it comprises an acoustic unit (22) for emitting at least two different acoustic signals corresponding respectively to each different state of the illuminating unit (20). 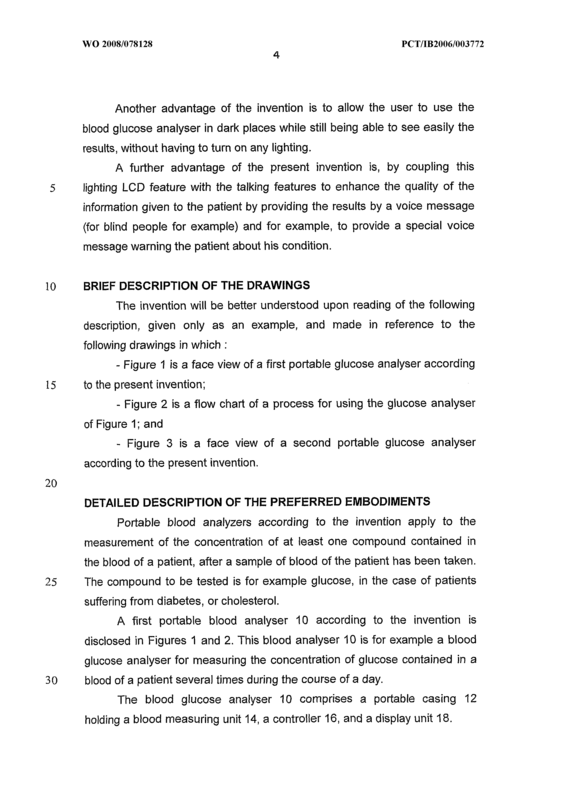 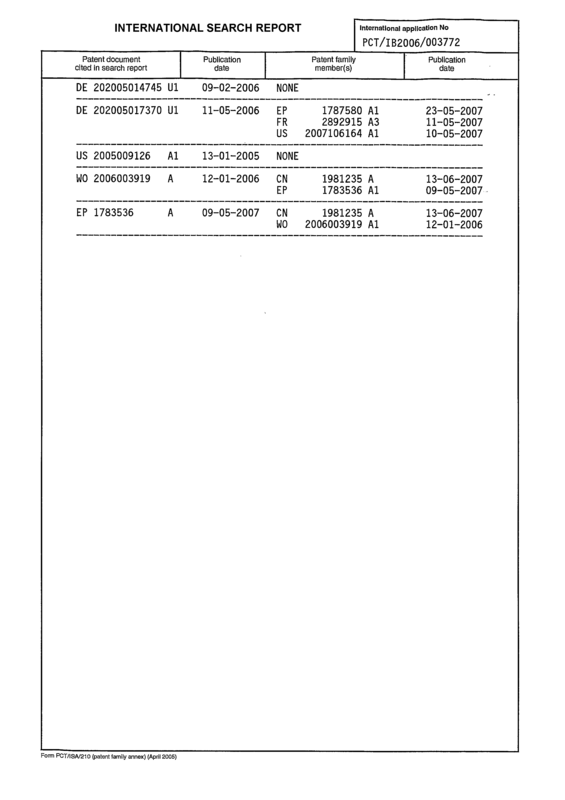 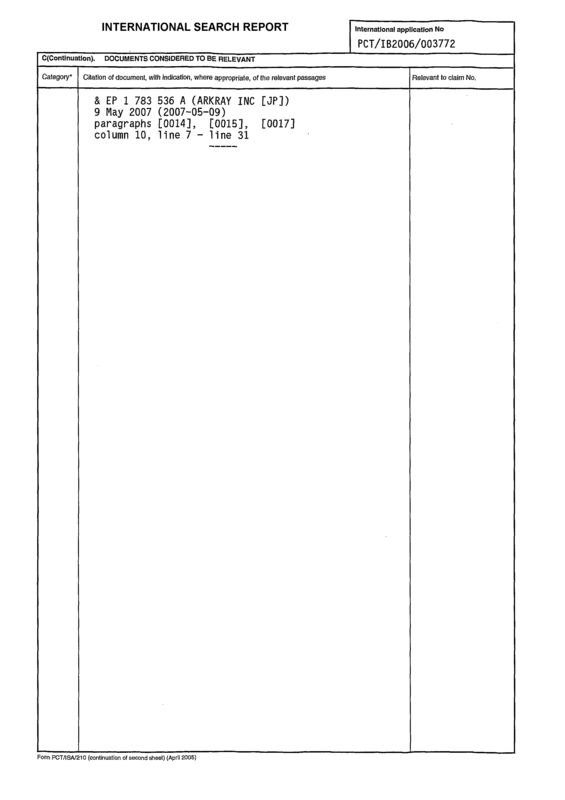 A portable blood analyser (10) according to claim 6, characterized in that the or each acoustic signal is a voice message. 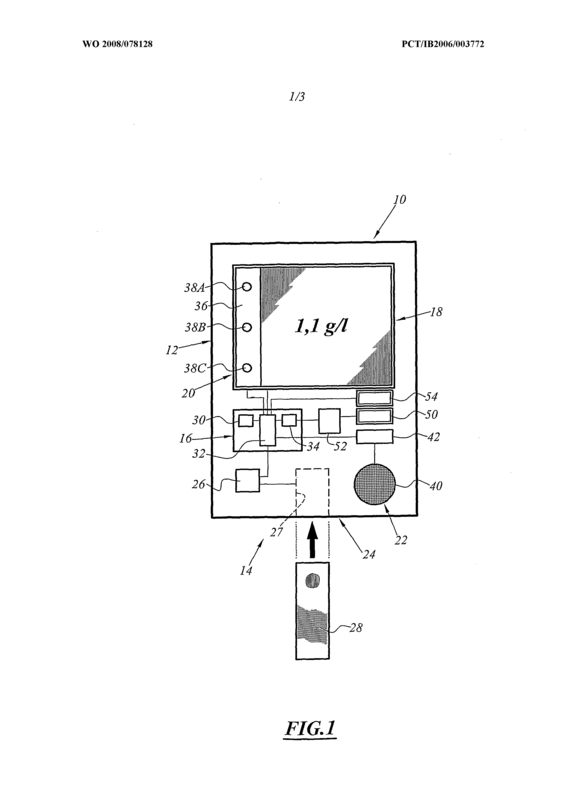 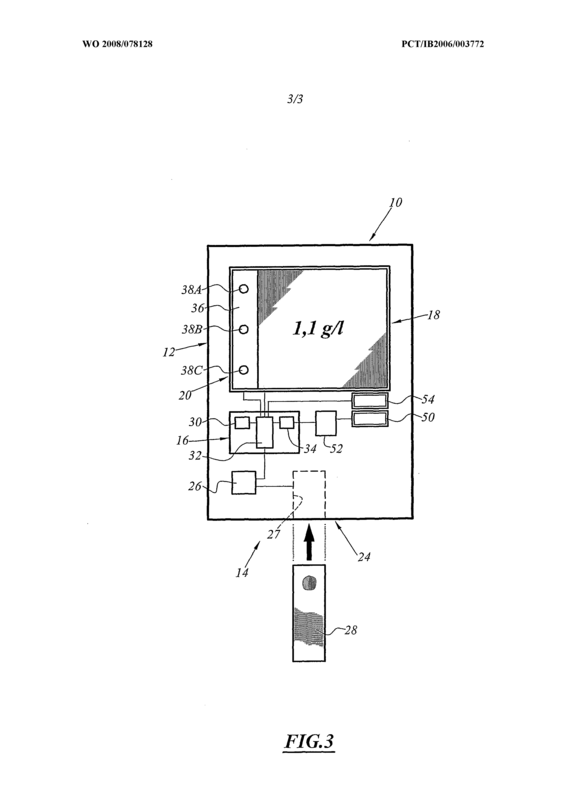 A portable blood analyser (10) characterized in that it comprises a blood holding stripe receptacle (27), the blood measuring sensor (26) being able to measure the concentration of the compound in the blood contained in a stripe (28) placed in the blood holding stripe receptacle (27). 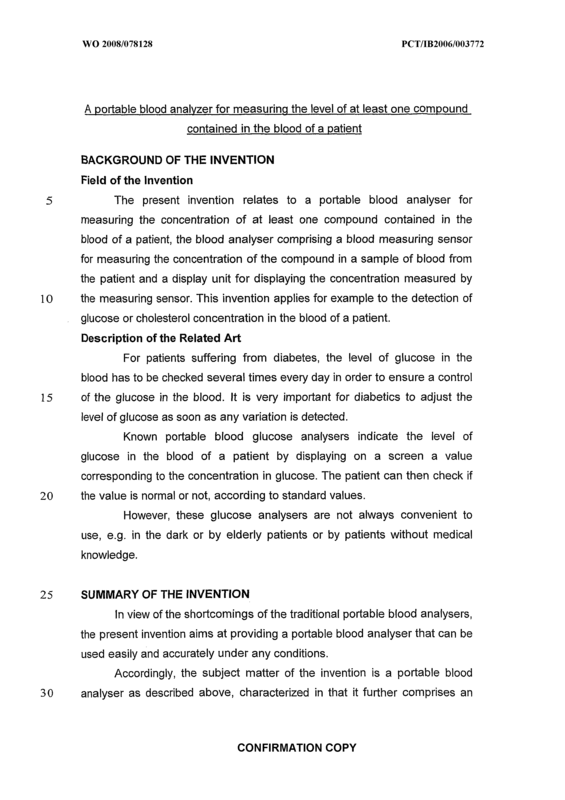 A portable blood analyser (10) characterized in that the compound is chosen among glucose or cholesterol. 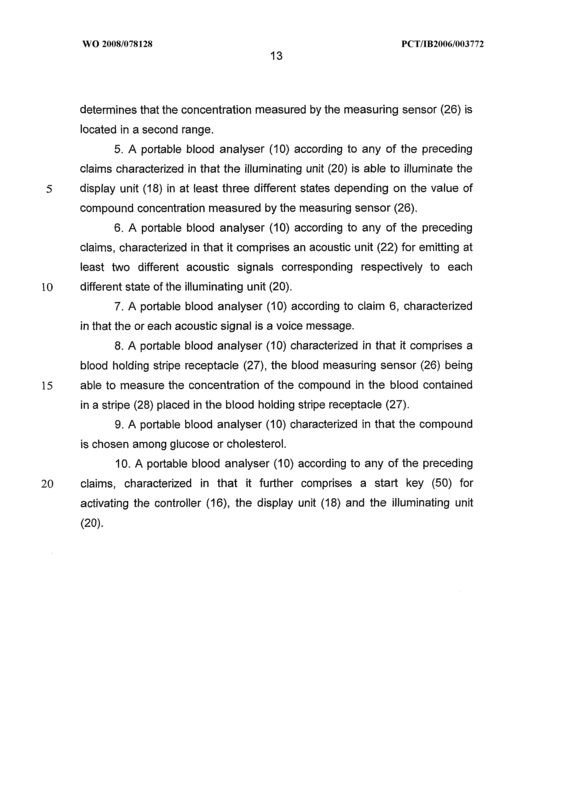 A portable blood analyser (10) according to any of the preceding claims, characterized in that it further comprises a start key (50) for activating the controller (16), the display unit (18) and the illuminating unit (20).